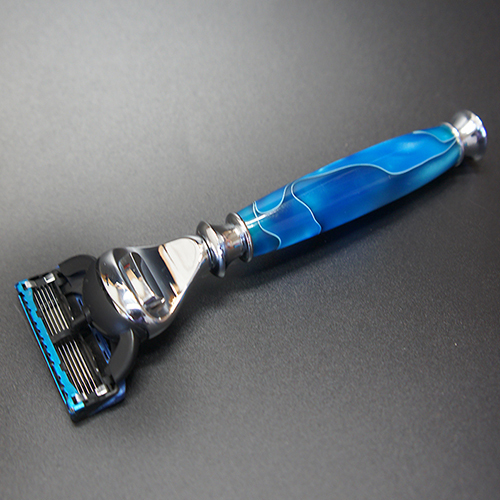 We believe the razor you use should be more than a hunk of mass-manufactured plastic. Each Imperium razor handle is unique and hand made by craftsmen in Baltimore. Pairing our heirloom quality razors & stands with our natural soaps & oils, the Imperium line of products will engage your customers and drive repeat business. 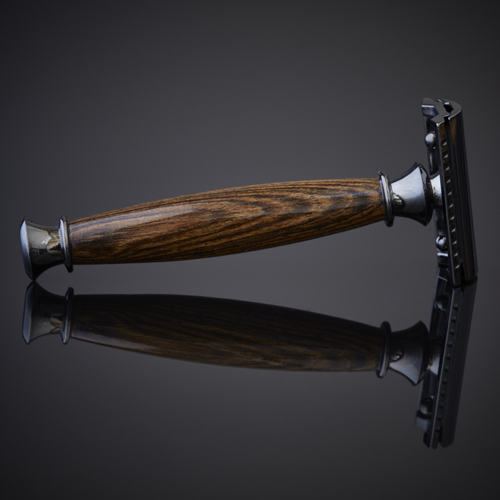 An exotic wood razor handle fit for a king. B&W Ebony is a sustainable wood native to India & Asia. Bold, inky black streaks flow over a blonde base, creating a striking contrast. For fans of black tea, dark whiskey, & abstract art. Fits Gillette blades. 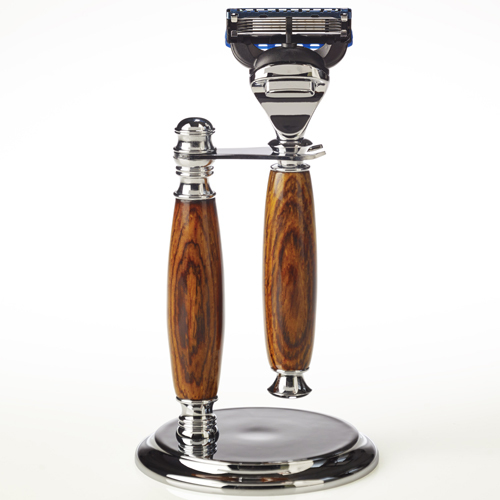 The Mira set: a hand-turned razor and matching stand. 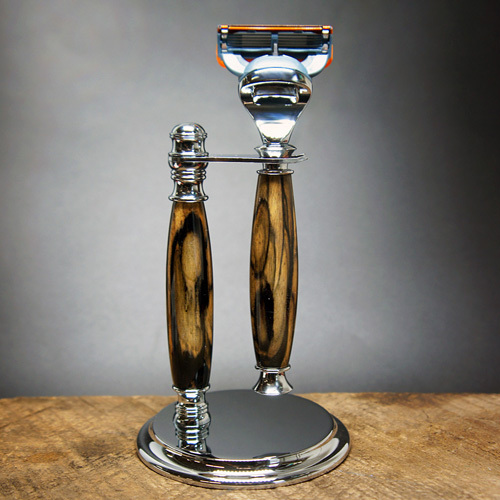 A shaving set in exotic wood, fit for a king (or queen). Made from Black and White Ebony (or “pale moon ebony”), a rare and beautiful wood native to India and Southeast Asia, where its bark and fruit are used in Ayurvedic medicine. Bold, inky black streaks flow over a blonde base, creating a striking contrast. For fans of black tea, dark whiskey, and abstract art. The Chicago takes you back to the days where an old-fashioned shave in the barber shop was a regular occurrence, and almost 1/3 of all candy sold in the United States was produced in Chicago. At its peak, the Chicago candy industry boasted more than 100 companies employing some 25,000 Chicagoan's. The Chicago is a unique handle reminiscent of a mix of crystallized sugars being stirred under the surface before being combined in a delicious mix. The Chicago fits the popular Gillette Fusion line of cartridges. Just as with wood, each acrylic handle takes on its own unique bands and veins of color, so each is one-of-a-kind. Acrylic handles are impervious to water and mold, making them ideal for use or storage in the shower. Shaving: a daily ritual for most of us. The razor you use should be more than a hunk of mass-manufactured plastic. Inspired by the tide pools of the Pacific shore, this gorgeous razor in hand mixed pacific-blue plant based resin refracts the light just like deep ocean waves. Perfect for a diver, surfer, sailor, or anyone who feels at one with the sea. 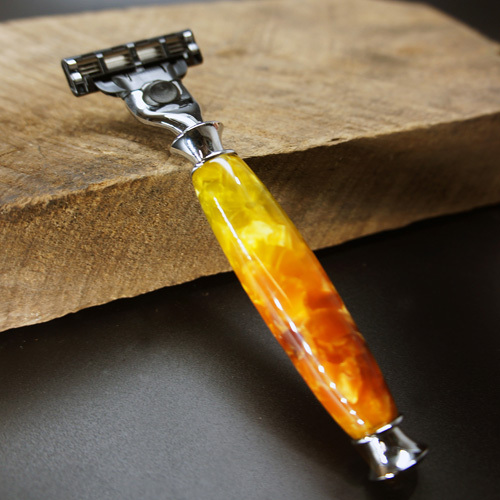 Our acrylic razors are made from plant based resins. The razor you use should be more than a hunk of mass-manufactured plastic.